If the organizers of the numerous illegal immigration, oops, make the immigration marches scheduled for May 1 want to be taken a little more seriously, perhaps they should choose a day besides the old Commie holiday of May Day. Yes, I'm aware that celebration of May Day goes back thousands of year, but the leftists seized control of the day in the 19th century. Chicago, among other cities, will have a big immigration march on Tuesday, with at least one local television station promising live coverage of the event. Just like last year's parade, it's probably going to rain in Chicago this May Day too. UPDATE: May 1: It appears the rain has already passed through the area. Some 1700 Church of England churches alone have closed since 1969. According to the umbrella Muslim Association of Britain there are nearly 1600 mosques across Britain. It's safe to say most of those mosques weren't there in 1969. Islam Online is not always the most reliable source of information, but I'm willing to take their word for it this time. Yes, there are other Christian faiths in Britain besides the "C of E," but by any account, with the possible exception of the Roman Catholic Church, church membership and church attendance is plummeting in the UK. I've read numerous times that more Muslims attend weekly religious services in Britain than Christians. If there was ever a time for a strong voice from the heart of Christianity, this would be it. And yet most mainline Protestant churches are as wedded to the platitudes du jour as the laziest politician. A Muslim Britain or Europe isn't automatically a bad thing. But an extremist, Wahhabi influenced form predominant there would be. Are the fertilizer plotters and the 7/7 bombers aberrations? Or the tip of the iceberg? One of the hurdles Barack Obama faces in his quest to win the Democratic presidential nomination is of the manner his former pal, Tony Rezko, continues to make news. Four years after a company with ties to indicted political insider Tony Rezko landed a lucrative no-bid Cook County contract, there's no evidence the firm has done any work for the millions of dollars it has made. Crucial Communications is a minority-owned subcontractor on AT&T's pact to provide phone services at the county jail. But a recent audit shows the company has not submitted any documents showing what it has done for the more than $2 million it has received, other than help AT&T meet its minority contracting requirement. Crucial Communications is headed by Jabir Muhammad, son of former Nation of Islam leader Elijah Muhammad. In 2005, the City of Chicago accused Muhammad of serving as a minority front for Rezko on an O'Hare Airport contract. Next month, or maybe next week, there will be something else. I don't have any inside information, but Rezko had his hands in so many deals, it's almost a certainty that the drip...drip...dripping will continue. White Sox, according to captain Eddie Collins, had not let the thought of a no hitter, to say nothing of a perfect game, dawn on them until just three men stood between Robertson and the rarest of baseball glory. Robertson was making just his third major league start; he was up against Ty Cobb's Detroit Tigers--the ornery one was managing the team then. Cobb protested the game, claiming Robertson was throwing spitballs, which had been banned the season before. It's a common saying that "any pitcher can throw a no-hitter," just a little skill and a lot of luck are needed. For proof of that, there is Bobo Holliman of the St. Louis Browns, who in 1953 threw a no-hitter in his first major league start, and won just two more games in his very brief major league career. Only the greatest pitchers, so it's believed, have the skill to throw a "perfecto." But to counter that mantra, there is Charley Robertson. Robertson had a much longer career than Holliman, but his career record ended up being just 49-80, the worst of any pitcher who threw a perfect game. There would not be another perfect game thrown in the majors until the New York Yankees' Don Larsen performed the feat in the 1956 World Series. The next regular season perfect game would have to wait until 1964, when current US Senator Jim Bunning (R-KY) tossed one for the Philadelphia Phillies. As I blogged last week, Girls and Boys Town employee Scott Hastings is attempting to run 480 miles across Nebraska. But there is bad news, an injury of an undetermined nature has forced Giddings to temporarily abandon his run. He was roughly half-way into his journey, at the town of Hastings in the south-central part of the state, when he decided to put the run on hold, and head to Omaha where he lives. Just before leaving Hastings for Omaha tonight, I received a package of letters from some Girls and Boys Town kids. The timing was perfect considering I was heading for home in a matter of minutes and the reason why. For a guy who has spent the better part of today thinking I am letting people down, the letters only helped to strengthen my resolve to finish what I started. They also showed me once again, just how important the work is that is being done at Girls and Boys Town. I continue to be humbled by our roles in this world and just what it is that we are here for. This is not a failure and I am not quitting, of that you can be sure. Thank you to everyone who has shown such support and encouragement to this point. I hope you will stay in touch for more information on the completion of the run. Please, if you do nothing else, continue to follow the mission of Girls and Boys Town and if you are in Omaha, stop by the campus and see for yourself first hand the work that is being done. The man ran 232 miles in a little more than a week. Well done, any way you look at it. It should be a rule of photojournalism that having no picture with a story is better than having a bad one. 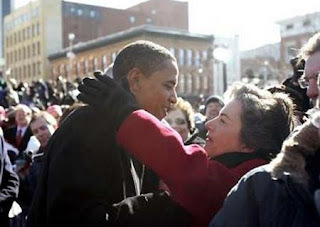 Such is the case with this photograph that I found on the polital site of my congresscritter, Jan Schakowsky, (D-IL). Reuters took the photo, and no one is going to accuse them of "PhotoShopping" it. It was taken shortly after Barack Obama's presidential announcement in Springfield. Schakowsky was in the news recently, and fortunately for Jan, it had nothing to do with her organization's failure to unseat longtime Alderman Bernie Stone in Chicago's 50th Ward. It's about horses--a recent hot topic on Marathon Pundit. Schakowsky is a co-sponsor of a bill that just passed the House that forbids the slaughter of wild horses and burros caught on federal land for human consumption. She's also a co-sponsor of another bill that would ban the practice outright. Although she'll be quick to blame the Republican majority in the House that ended in January, I can't find any evidence of Schakowksy having a bill enacted into law in which she was the principal sponsor. 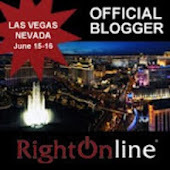 This site, GovTrack, says she hasn't cracked the "first one" threshold. Trilliums weren't the only thing I saw this afternoon in Harms Woods. Did you forget where you docked your red canoe? If so, I can tell you exactly where to find it. I first saw this vessel about a month ago on the North Branch of the Chicago River about a month ago, about 50 yards from the running path. It only occurred to me today to take a closer look. Fortunately, there was only some muddy water in the canoe--to be more blunt, there was no body, as in Boromir in The Fellowship of The Ring. The canoe is chain-locked to a tree, and the oars are missing (stolen? 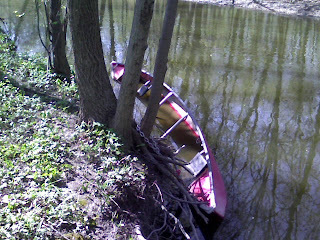 ), so unless the owner--or someone with a lockcutter comes forth, the canoe will be there for a long time.